Russia will show its strongest naval muscles at the Navy Parade in July. TK-208 «Dmitry Donskoy» is the only remaining Typhoon-class submarine in operation. The 172 meter long giant was originally built to assure the Soviet Union’s ability to respond to a nuclear attack with a powerful retaliation. Carrying 20 missiles and up to 200 nuclear warheads, the sub could stay hidden under the Arctic ice cap and assure a second-strike against the attacker. Today, «Dmitry Donskoy» serves as a test-platform for new ballistic missiles and is based in Severodvinsk by the coast of the White Sea. 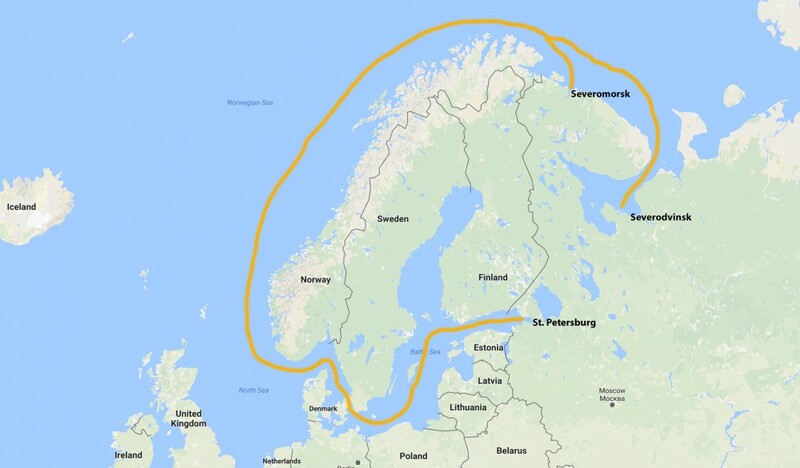 This summer, the heavy missile submarine will sail out of the White Sea, across the Barents Sea on a voyage that continues along the coast of Norway, into the North Sea and Skagerak outside Denmark, and further across the Baltic Sea between Poland, Sweden and the Baltic States, before heading in to the Gulf of Finland towards St. Petersburg. Voyage routes from Severodvinsk and Severomorsk to Kronstad outside St. Petersburg. Google-maps. Izvestia reports the Typhoon submarine will participate in the Navy Parade at Kronstad outside St. Petersburg on July 30. The General Staff of the Russian Navy is now awaiting President Putin to sign a final approval decree, said to happen next month. The oldest of the six Typhoon submarines built. Three other Typhoon are scrapped, while two are laid up. According to Izvestia, preparation for the transfer voyage from Severodvinsk to Kronstad has already started. The voyage will be first time in naval history that such huge nuclear powered submarine sails into the Baltic Sea. For those who want to see, but can’t go to St. Petersburg, the vessel will have to sail at surface under the Great Belt bridge where vessels with a maximum draught of 15 meters can sail. According to Swedish Maritime Administration, the waters under the Öresund bridge or the Flint channel are too shallow. The draught of a Typhoon submarine is 12 meters. Nuclear physicist Nils Bøhmer with the Bellona Foundation says the voyage gives reason for concern. «I’m concerned when a nearly 40-years old nuclear submarine with two relatively large reactors on board will sail such a voyage along the coast of Norway and into the Baltic Sea. Nordic authorities must make sure the exact time of the voyage is announced so preparedness can be put in place. It is also necessary to get assurance that there are no nuclear weapons on board,» Bøhmer says to the Barents Observer. In St. Petersburg, «Dmitry Donskoy» is also supposed to take part in the International Maritime Defense Show taking place from June 28 to July 2. In Arctic Oceans, «Dmitry Donskoy» has been used as the test platform for Russia’s new Bulava ballistic missiles. Launches of the missiles from the White Sea towards targets on the Kamchatka Peninsula in the Far East. Additionally to the Typhoon, the Russian Navy will also sail its largest nuclear powered battle cruiser, the «Pyotr Velikiy» to Kronstad for the Navy Day. The battle cruiser is Russia’s most powerful surface warships and is based with the Northern Fleet with Severomorsk on the Kola Peninsula as homeport. «Pyotr Velikiy» is powered by two nuclear reactors and carries a wide-range of weapons including cruise-missiles and several types of surface-to-air missiles, torpedoes and rocket launchers. …. we hope you enjoyed reading this article. Unlike many others, the Barents Observer has no paywall. We want to keep our journalism open to everyone, including to our Russian readers. The Independent Barents Observer is a journalist-own newspaper. It takes a lot of hard work and money to produce. But, we strongly believe our bilingual reporting makes a difference in the north. We therefore got a small favor to ask; make a contribution to our work.